If you're looking for something niche and different to show off, the projector does the trick, but the specs just aren't up to scratch otherwise for a phone of this cost. As we pointed out in our hands-on test, this isn't the first time Samsung has tried foisting a projector phone on an unsuspecting public: but perhaps this will be the first time it succeeds? It's not cheap either: £31 a month contract and a £400+ SIM-free price make it hard to recommend to the budget brigade... and with these specs we'd expect to have something a bit more wallet-friendly. But it's got a whopping projector stuffed in there, so let's not be too harsh. So: down to the nitty gritty. 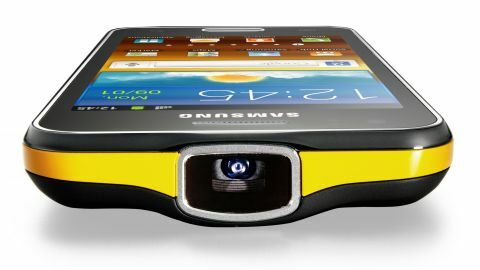 For a handset packing a 15 lumens projector, the Samsung Galaxy Beam does a good job of slimming its hardware into a decently lightweight package. It's a sporty-looking number, thanks to the yellow and chrome bezel and the soft, rubberized battery panel on the back. It weighs in at 145g; just 5g more than the Apple iPhone 4S and the projector is sleekly moulded into the frame. At 12.5mm it's a little chunkier than most smart phones, but for obvious hardware-related reasons. If you have smaller digits, the relative girth of the chassis makes it a little precarious and the smooth panelling makes it feel as though it's about to slip away from you when held one-handed. If it does though, the Samsung Galaxy Beam is a bit of a tough nut – it came away from two or three accidental drops with nary a scratch. Because of the projector placement, the 5MP camera sits a third of the way down the back of the phone: makes it a little too easy to accidentally cover with a finger, but ho-hum. The front of the Galaxy Beam bears only an external home button, VGA camera, thin chromed speaker and touch-screen keys. The sides of the handset pack in all the additional buttons: power and projector buttons, volume rocker, SIM and micro SD slots (up to 32GB additional storage), Micro USB, 3.5mm jack and the projector itself, the crowning glory on the top of the phone. The back panel eases off nicely and the phone itself comes with a spare battery and standalone battery charger – meaning you never need to be without charge. Our SIM didn't pop in and out easily, but this is likely down to using a micro SIM in a holder rather than a regular SIM. Given the placement of the projector, the 3.5mm jack sits on the left-hand side, which is a teeny bit annoying when trying to snugly fit this beast into pockets. The external body of the Samsung Galaxy Beam seems to stack up so far against its rival high-cost smartphones (coming in at just under £400 SIM free), but what is it packing inside? Well, that would be Android 2.3 Gingerbread, though an Ice Cream Sandwich update is rumoured. It features a bright 4-inch WVGA touchscreen that indoors is perfectly bright and vivid in its display, but falters somewhat in daylight.